The seminar tour was held at five different locations across the UK including Swindon, London, Belfast, Glasgow and Birmingham. It saw global innovators in airtightness offer technical advice, give practical demonstrations and lead debate on a wide variety of specification challenges in order to achieve optimum fabric efficiency. 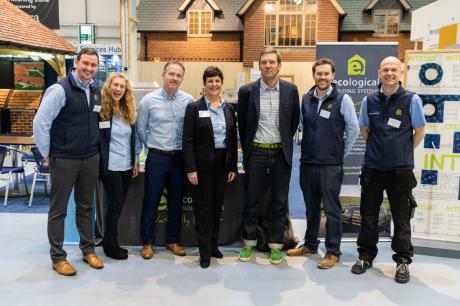 Together with pro clima, Ecological Building Systems launched the insightful programme to celebrate BBA approval of its pro clima Intello Plus Intelligent Airtight Membrane. With the help of experts, each seminar offered attendees a unique opportunity to explore the BBA certification of pro clima Intello Plus Intelligent Airtight Membrane and receive thorough training on managing moisture in construction and achieving airtightness in both new and retrofit builds. .
As part of the esteemed line up, speakers included architectural designer and television presenter Charlie Luxton; pro clima’s engineer head of applications technology Michael Foerster; executive chair of The Alliance for Sustainable Building Products, Gary Newman; Patrick Chester, passivhaus consultant at Enhabit; and Ioan Sulea, founder and director of Oasis Construction. Explains Niall Crosson, group technical manager at Ecological Building Systems: “The feedback we have received from the delegates who attended our seminars has been phenomenal. Our aim was to educate professionals that thermal performance and year-round building comfort can be achieved by factoring in airtightness from the outset of any new project. By using high performance products such as pro clima Intello Plus, architects and specifiers can have complete peace of mind that the risk of structural damage is greatly reduced.